If it seems like every time you drive on the highways of San Antonio lately there are more and more cars around you, that’s not just your imagination. Recent statistics from the U.S. Census Bureau confirm that seven of the fastest growing cities in the U.S. are in Texas. And San Antonio tops the growth list for the state, with more than 24,200 new residents having come here in the past year alone. So, how best to make sense of the growing popularity of the Alamo City, where the city has come from, and where it’s headed in the coming years? 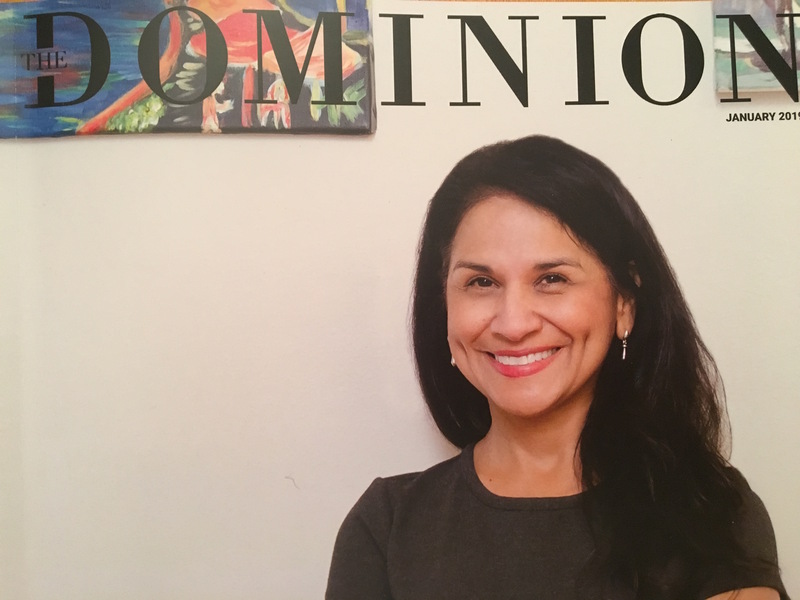 Well, turns out one of our neighbors right here in the Dominion is Deborah Perez, a professional statistician and Ph.D. in Applied Demography, just the person to fill us in on what the future holds in store for Texas and for San Antonio. But before we dive into the numbers, a bit about Debbie and how she came to be the expert she is on all things demography. Debbie was born on San Antonio’s northeast side and grew up there with her parents and two sisters (she is the youngest of the three). Her mother (from Pearsall) and father (from Natalia) owned a successful janitorial service that served local businesses during the week and weekends, and Debbie recalls going out with her mom on jobs. By the time she was just finishing up her freshman year of high school, her parents sold the business and moved with Debbie to Floresville (her older sisters had left home by then), where they opened a convenience store called Squeak’s. Her parents operated this store, with plenty of help from Debbie in the early going, for another twenty or so years before retiring and moving back to Natalia, near where they had originally met at a local dance. It’s a family with interesting historical roots, with one distant grandparent having played in Pancho Villa’s band and an uncle having made tequila for the renowned Mexican general (who, as it happens, shares a birthday with Debbie!). Ever independent and enthusiastic to get on with life, Debbie completed high school a year early and left for the University of Texas in Austin where she pursued a Bachelors degree in Business Management. Though her parents had only elementary school educations, they were, through their hard work and business success, able to put Debbie through college and her Master’s program. The family was so dedicated to work that they seldom vacationed, opting instead for the annual weekend on the Guadalupe River, picnicking and swimming. Recently relocated from the small-town life of Floresville, Debbie relished the campus life at UT, the breadth and depth of a huge college campus with its arts, music, and culture, and she seized on the opportunity to begin discovering who she was and what she wanted to do with the rest of her life. She was randomly paired with her freshman roommate and the two remain the best of friends to this day. She recalls many similarities between the two young women, including the fact that both left for college entirely on their own, with parents entrusting car keys and a bank account to make the journey to Austin alone. As part of her business curriculum she was required to take marketing classes, and it was here that she received her first exposure to the field of demography. She recalls being captivated by it from the start, an auspicious beginning to what would become her professional passion in life. Upon graduation in 1982, the economy in Texas was in very bad shape and jobs were scarce. After working for a year as a branch manager for a savings and loan, she decided the time was ripe to pursue a graduate degree and learn more about the forces driving the economy, a decision that led to her earning her Master’s in Economics at St. Mary’s University. Debbie married shortly after completing her Master’s and had two daughters (who now have degrees of their own from UT, UVA, and Northwestern Oklahoma State). Following grad school, Debbie worked for ten years at USAA before transitioning to UTSA as a budget director. While she was there, the school approved the creation of a Ph.D. program in Applied Demography, the details of which she vividly recalls coming across her desk one day. It was a life changing moment and she immediately began looking into the program, discussing it at length with the program creator, Steve Murdock, a mentor with whom Debbie would later go on to co-author two books on demographics. Long story short, she was accepted into the program, put all of her available financial resources into paying for it, and, four and a half years later, in 2010, emerged with a Ph.D. in Applied Demography. While pursuing her Ph.D., Debbie worked for the Texas Higher Education Coordinating Board, during which time she also interned with the U.S. Census Bureau in Washington D.C. Following her thesis defense, she returned to Washington D.C. to take a position with the Department of Homeland Security as a program analyst managing a financial portfolio within the DHS organization. While there, she received an invitation from Steve Murdock to join his team at Rice University as a Research Scientist. It was during this period that Debbie co-authored a pair of demography books with Murdock: Changing Texas: Implications of Addressing or Ignoring the Texas Challenge (2014) and Population Change in the United States: Socioeconomic Challenges and Opportunities in the Twenty-First Century (2015), both of which titles have proven very influential with policy makers at the state and national level. A few data analytical insights are included throughout this piece to provide a flavor for the sorts of work demographers do and to give a sense for what lies ahead here in San Antonio. Following her stint at Rice, Debbie returned to D.C. where she took a position with the Department of Health and Human Services as a statistician working on the Temporary Assistance for Needy Families (TANF) program, responsible for delivery of the TANF Report to Congress. Eventually, for personal and professional reasons, Debbie found her way back to San Antonio about a year and a half ago. She says she still loves the northern Virginia area and will likely return there someday to retire, but the opportunity here was just too good to pass up. She is back with USAA once again and applying all of her statistics and data expertise in a forecasting project there. Thinking back on her life and how she got to where she is today, Debbie recalls always wanting to do something substantive with her life, something that spoke to having a good mind while also making a difference in society. That was why economics and demography spoke to her, i.e., these were academic pursuits that helped to explain why the world works the way that it does. But what do you do for recreation when you need to take a break and step away from the numbers and the analysis? For Debbie, that includes any number of pastimes, including community service, traveling, hiking, gardening, and skiing, or just hanging out at home walking her dog Rock. She has volunteered with the City of San Antonio Boards and Advisory Commission and worked with the school board for her daughter’s school. She first got seriously involved with hiking while living in Virginia, and she’s now a hike leader for one of the largest clubs in the country. In addition to biking San Antonio’s own mission trails, she organizes hikes for large groups, with destinations that have included even portions of the famed Appalachian Trail. She has hiked in other parts of the world too, including Iceland and Machu Picchu, Peru. She has also visited Paris and Cuba (including swimming in the Bay of Pigs) and indulged her love of skiing in Colorado. She looks forward to visiting Japan in the near future, as well as getting back to Virginia to visit friends. During our recent political season, Debbie opened her home for several networking and debate watching parties (which is how we first met). As for how she came to reside in The Dominion, she says that when she first returned to the area in 2016, she looked in numerous areas, but found that the garden-home style suited her lifestyle without being too labor intensive. She also really liked the floor plan of her home. So yes, there’s no question Texas is a fast-growing state—no place more so than right here in San Antonio. But you don’t need to look far to understand why: mild weather, reasonable cost of living, friendly people and culture, and the sort of boundless opportunity that allowed a young girl from a modest family to grow from accompanying her parents to clean offices and run a convenience store to obtaining a Doctorate and working for some of the most renowned companies and governmental organizations in the country. It’s a winning combination, even if it does mean a few more cars in the way on your morning commute.